The 2016 RBC Canadian Open golf tournament is taking place this week from July 21-24, 2016, at the Jack Nicklaus designed Glen Abbey Golf Club located in Oakville, Ontario, Canada. Here is a list of the betting odds for the PGA golfers to win the 2016 RBC Canadian Open. The big news for the 2016 RBC Canadian Open is that golf's #1 player Jason Day is in the playing field and is here to defend his title. Jason Day won the Canadian Open last year and it started a great run for him that saw Jason Day win his first golf major at the PGA Championship and become the #1 golfer in the world. Also in the field is top ranked Dustin Johnson giving the 2016 RBC Canadian Open playing field some real star power and making a bet on any other player this week a risky proposition. The Canadian Open dates back to 1904. Leo Diegel from the United States golds the record for most wins with four (1924, 1925, 1928, 1929). Lee Trevino, Sam Snead and Tommy Armour are tied for the second most wins with three each. Tiger Woods won this tournament in 2000, and as mentioned above, Jason Day is the defending champion. All golfers with betting odds of 75 to 1 or less are listed below with comments. Then some notable golfers with much higher odds are listed with comments explaining why. Good luck to all the PGA golfers and especially the bettors this week at the 2016 RBC Canadian Open! Jason Day is a worthy favorite to win the 2016 Canadian Open at betting odds of 5 to 1. Jason Day won this event last year and it started him on a great run that has seen him win seven tournaments including his first major at the 2015 PGA Championship. Day should have nothing but good feelings about this tournament and will likely play very well this week. Is he worth just 5 to 1 odds is the question this week? After winning the U.S. Open and the WGC-Bridgestone in back-to-back wins, Dustin Johnson tied for 9th at the British Open last week. 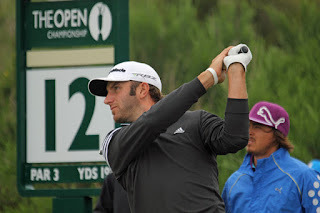 So he did not play badly at Royal Troon and Dustin Johnson is a big threat to win again this week in Canada. As with Jason Day, though, do you want to take such low 5.5 to 1 odds on DJ this week? If both Jason Day and Dustin Johnson falter this week why would anyone want to bet Matt Kuchar at 16 to 1 odds? Matt Kuchar has seven PGA Tour wins but his last win was over 27 months ago. Brandt Snedeker tied for 22nd at the British Open last week. Sendeker won the Farmers Insurance Open in January but since then has only cracked the top 10 once and he's missed five cuts in the 14 tournaments he's played in since the Farmers win. He's still a better bet for the win this week than Matt Kuchar is. Jim Furyk has two wins in the Canadian Open, but they were back in 2006 and 2007. Except for his good 2nd at the U.S. Open a few weeks back, Jim Furyk has not cracked the top 20 in the eight tournaments he's played in since coming back from wrist surgery. Jim Furyk has 17 PGA Tour wins but he's only won once since 2010. He was 4th in this tournament last year. Emiliano Grillo tied for 12th last week at the British Open. Grillo is 23 years old and he won for the first time on tour last October in the Frys.com event. Due to his age, he's likely a better bet this week than either Matt Kuchar or Jim Furyk. Tony Finau is lower odds this week because he played well at the British Open ending up tied for 18th place. Finau won the alternate event the Puerto Rico Open back in March for his first career PGA Tour win. Finau is 26 years old and like so many players this week his Canadian Open fate really depends on how well Jason Day and Dustin Johnson play. Charley Hoffman finished in 77th place last week. Since winning the Texas Open in April for his 4th PGA Tour win, Charley Hoffman has not cracked the top 10 over eight tournaments. Ryan Palmer has three PGA Tour wins but his last win was in 2010. Palmer tied for 30th last week at Royal Troon. Over 18 tournaments he's played in this season Ryan Palmer has just two top 10 finishes. Colt Knost missed the cut last week at the British Open. Knost is 31 and still looking for his first win on tour. Jimmy Walker also missed the cut last week. He's missed the cut in three of his last seven tournaments making him a risky bet this week. William McGirt also missed the cut at Royal Troon. McGirt is 37 years old and he won for the first time on tour at the Memorial in early June. Too risky for a bet here. Bryson DeChambeau has missed the cut in four of his eight starts as a pro but does have a 4th place finish on his record. Chris Kirk missed the cut last week but could play well this week. David Hearn is 37 and has to win on tour but he's from Canada and he finished 3rd in the Canadian Open last year. Graeme McDowell has missed the cut in five of his last 10 starts on the PGA Tour. Graham DeLaet is another Canadian who has yet to win on tour at age 34. DeLaet tied for 7th in the Canadian Open in 2014. Kevin Streelman has two PGA Tour wins with his last win coming a little over two years ago. Danny Lee missed the cut at Royal Troon last week and hasn't cracked the top 20 in a tournament since May. Matthew Fitzpatrick missed the cut at the British Open last week and that was his third missed cut in a row. But this kid is only 21 years old and he already has two wins on the European Tour including the Nordea Masters in June. Matthew Fitzpatrick has real talent and might be worth a shot this week a big odds. He the one player this week with the talent to challenge Jason Day and Dustin Johnson. Chez Reavie won the Canadian Open in 2008 for his only career win. He's missed the cut in five of his last 10 starts but did finish 7th at the Houston Open at the end of March. Sean O'Hair won the Canadian Open in 2011. That was the last of his four PGA Tour wins. He's a very mild threat this week. Carl Pettersson won the Canadian Open in 2010. He has five PGA Tour wins with his last win coming in 2012. Pettersson has missed far cuts than he has made this season hence the huge betting odds to win.